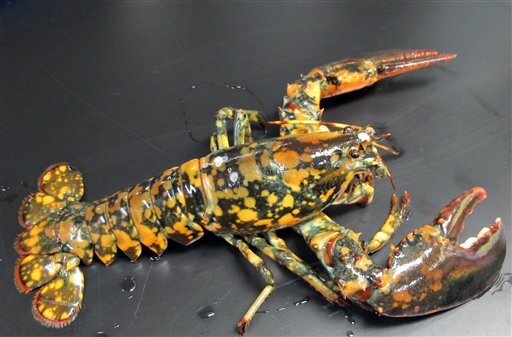 This photo provided by the New England Aquarium in Boston on Wednesday, May 9, 2012, shows a rare calico lobster that could be 1 in 30 million, according to experts. It was caught off Winter Harbor and is being held at the New England Aquarium for the Biomes Marine Biology Center, a science center in Rhode Island. BOSTON — So you think blue lobsters are rare? The New England Aquarium is holding a lobster that’s way rarer than that. The aquarium in Boston says it has a calico lobster that could be a 1-in-30 million lobster. Correction: An early version of this story requires correction. The AP reported the lobster was caught off Winterport — it was caught off Winter Harbor.